Fixed a problem that prevented command line captures from working in Firefox 55 and 56. Note: This classic Page Saver extension is not compatible with Firefox 57 or newer. Please use our new WebExtensions-compatible Page Saver WE extension instead. While we no longer develop or provide support for this classic extension, it may continue to be used in browsers such as Pale Moon which support XUL/XPCOM extensions. Pearl Crescent Page Saver is an extension for Mozilla Firefox that lets you capture images of web pages, including Flash content. These images can be saved in PNG or JPEG format. 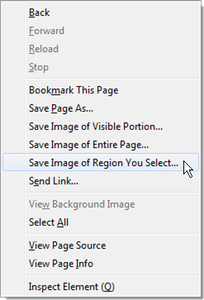 Using Page Saver, you can capture an entire page, just the visible portion, or a region that you select. You can control the image capture process via a wide variety of settings, including the image file name and scale (e.g., save at 50% of original size). Page Saver works with Firefox 36 – Firefox 56 on Microsoft Windows, Mac OS X, and Linux x86, and should work on all platforms where Firefox is available. Chinese (Simplified), Chinese (Traditional), Czech, Danish, Dutch, English, French, Galician, German, Greek, Hungarian, Italian, Japanese, Korean, Polish, Portuguese (Brazil), Russian, Slovak, Slovenian, Spanish (Spain), Swedish, Turkish, Ukrainian. Check the list of known issues. If you have comments about Page Saver, please send us feedback. Pearl Crescent Page Saver is Copyright © 2005-2017 Pearl Crescent, LLC. Please contact us if you are interested in licensing the source code or if you want to redistribute the software. Pearl Crescent Page Saver may be used in packaged, binary form for any legal purpose at no cost. The software is provided "as-is" and Pearl Crescent makes no other warranties with respect to its quality, performance, or fitness for any particular purpose. Copyright © 2005-2019 Pearl Crescent, LLC.